One might disagree with the content of someone’s speech or the way the freedom of expression is used or misused, but that by itself is no reason to call for its curtailment because the luminance of the freedom of expression far outweighs and outshines the flickering darkness of a few grey shadows that the presence of light might cast, says HEMRAJ SINGH. On February 20, 2019, one Ritesh Dhar Dubey, a Ph.D. scholar and a guest lecturer teaching at the Faculty of Law, Delhi University, was beaten up by one of his own students and was dragged to the nearest police station for his allegedly “anti-national”1 remarks during a lecture, which, according to a pamphlet later circulated in protest, sought to “persuade and brainwash students by using derogatory statements against our martyrs.” Mr. Dubey denies having said anything derogatory and insists that he had merely said that there was a need to “question the government on the state of this conflict.”2 However, the police instead of registering a complaint against Mr. Dubey for his remarks registered an assault case against the student in question. According to the student, referring to the deceased victims of the Pulwama attach, “the professor said why feel sad for those who are there to die.” (Ibrar, February 2019). The fact that the student in question dragged the professor to the police station indicates that to his mind Mr. Dubey had committed an act of sedition or treason by being harsh and insensitive in his reference to the victims of the Pulwama attack. The professor has denied making any derogatory references to the martyred personnel of the Central Reserved Police Force (CRPF), but assuming, for the sake of argument, that he did speak as alleged, does it amount to seditious speech or an “anti-national” act? Regardless of the larger point that Mr. Dubey was trying to make and his insensitivity in going about it, the student’s taking the teacher to the police station is worrisome because it reflects the anti-democratic and utterly unconstitutional notion that speech alone can be seditious or “anti-national”. Such an idea is contrary to the foundational spirit of the constitutional democracy that India is, and for that reason it is, by all means, “anti-national”, for what can possibly be more anti-national than what offends the Constitution itself? It is even more disturbing that an increasing number of educated people seem to understand sedition as narrowly as to make the idea not just unconstitutional and undemocratic but also anti-constitution and anti-democracy. Besides, there is nothing “anti-India” in criticizing India as a nation for its internal or external policies, or the people of India, individually or collectively. Also, a mere praise for even the enemy for something one considers worthy of praise does not by itself make one any less of a patriot, far less an “anti-national,” just like one’s appreciation of the bravery of an enemy soldier is not a weakness of will or lack of courage or want of love for one’s nation, but is just an honest expression of an opinion born of facts as one sees them. Turning away from the truth for any reason howsoever noble or grand gives rise only to false foundations that could prove treacherous at the most pressing times leading to avoidable disasters. However, the case of Kanhaiya Kumar, the former president of the Jawaharlal Nehru University Students Union (JNUSU) has been in dazzling media spotlight ever since the event on February 9, 2016 took place on the campus of Jawaharlal Nehru University (JNU), in which “anti-India” slogans were allegedly raised by some of the attendees, for which sedition charges were later slapped against Kanhaiya Kumar, Anirban Bhattacharya and Umar Khalid among others. It was alleged that slogans like “Kashmir ki azadi tak jung chalegi, Bharat ki barbadi tak jung chalegi” were raised at the protest meet organized “against the judicial killing of Afzal Guru and Maqbool Bhatt.”4 However, a high-level inquiry committee constituted by JNU to probe the matter found that the provocative slogans were raised “by a group of outsiders.”5 All JNU students involved, including Kanhaiya Kumar, have maintained that they had not raised any “anti-India” slogan. Kanhaiya Kumar was granted bail by the Delhi High Court on March 2, 2016. However, the order by the Delhi High Court granting bail to Kanhaiya Kumar does little to warm hearts. The court reminded petitioner Kanhaiya Kumar of the Fundamental Duties under the Constitution of India remarking that “rights and duties are two sides of the same coin” (Para 43). Slogans cannot pose any real threat to “national integrity” unless accompanied by a call for disruption of peace followed by overt acts resulting in widespread, violent uprising, which can only happen if people in large numbers identify with the cause of such slogans, which, in turn, can come to pass only if the concerns of the large sections of people have stood without redress for long. Slogans that really have the capability of turning into mass movements are not the “infection” but, like pain, are the overt symptoms of a festering wound calling for urgent remedial measures. However, the kind of slogans the High Court was reacting to are neither problems, nor solutions. They are just provocative irritants of no real consequence. To be provoked into action by them is to honour them with success whereas ignoring them in deference to the constitutionally guaranteed freedom of speech renders them completely ineffective. Oddly and interestingly, on the question of what constitutes Sedition under Section 124A, the Delhi High Court refers to the Gujarat High Court judgment in Hardik Bharatbhai Patel vs. State of Gujarat, 2016 (1) RCR (Criminal) 542, which is not binding on the Delhi High Court, but completely ignores the Constitutional Bench judgment in Kedar Nath Singh v. State of Bihar, AIR 1962 SC 955, which is not only binding on it but also expounds the law with regard to Section 124A saving it from the sweeping axe of Article 19 (1) (a) read with Article 13 (1). With a literal interpretation, Section 124A could not be constitutionally sustained. “If, on the other hand, we were to hold that even without any tendency to disorder or intention to create disturbance of law and order, by the use of words written or spoken which merely create disaffection or feelings of enmity against the Government, the offence of sedition is complete, then such an interpretation of the sections would make them unconstitutional in view of Art. 19(1)(a) read with cl. (2),” said the Supreme Court in Kedar Nath Singh. Citing R.M.D. Chamarbaugwalla v. The Union of India, AIR 1957 SC 628, another Constitution Bench judgment, the Supreme Court chose to take such view with such limits on the applicability of the impugned provision as would prevent it from being unconstitutional. Clearly, Section 124A does not sit comfortably with Article 19 (1) (a), and has been readjusted — rather, refashioned — to fit in with considerable effort by the Supreme Court. Kedar Nath Singh holds that Section 124A as it stands is unconstitutional, and is sustainable only when the words used under the provision are not given a literal meaning but are read to the effect of criminalizing such speech that is intended to incite violence and disrupt law and order as a means to oppose the government or public authorities. “It is only when the words, written or spoken, etc. which have the pernicious tendency or intention of creating public disorder or disturbance of law and order that the law steps in to prevent such activities in the interest of public order,” the Supreme Court said in Kedar Nath Singh. In Kanhaiya Kumar case, the Delhi High Court committed a grave legal error — although of little practical consequence — by citing the text of Section 124A without discussing or even referring to the law laid down by Kedar Nath Singh because in reading Section 124A as it stands on the statute book the Delhi High Court quoted as valid the law that has been long ruled unconstitutional by necessary implication in Kedar Nath Singh, wherein the Supreme Court provided an alternative reading to the provision to make it constitutionally sustainable. The slogans allegedly raised in JNU on February 9, 2016 could not have moved people in JNU or Delhi to rise in violent, large scale protests against the government of India and thus posed no threat to the “sovereignty and integrity of India”, but some of the pricking slogans could still incite people to react aggressively against such provocative sloganeering thereby “creating public disorder or disturbance of law and order,” as required by Kedar Nath Singh to attract Section 124A. It is only the “public disorder” angle that can make Section 124A stick in Kanhaiya Kumar’s case against the sloganeers without getting into difficulties with Article 19 (1) (a), but Delhi High Court seems to have taken the approach that sets Section 124A on the same collision course with Article 19 (1) (a) that Kedar Nath Singh sought so hard to prevent because treating sloganeering alone as sufficient to attract Section 124A brings the provision into headlong collision with Article 19 (1) (a) rendering it unconstitutional, which was why the Supreme Court interpreted the provision such as to travel beyond mere speech to include overt acts of incitement to violence and disruption of public order. Although the legal position with regard to Section 124A vis-a-vis Article 19 (1) (a) remains firmly underpinned and secured by the Constitution Bench pronouncement in Kedar Nath Singh, there has been a rapid growth in the disturbing tendency to equate sharp criticism and strident dissent with “anti-national” sentiments or seditious tendencies summarily dismissing the self-evident truth that freedom of speech is meaningless without the freedom to voice unpopular opinions, and it is on the force of freedom of thought and expression that vibrant democracies prosper and civilizations of note rise and flourish. Fundamental Rights sit at the very heart of the Constitution, and among those, Article 14, 19 and 21 form the inviolable trinity, which even a law otherwise immune to challenge for violation of Fundamental Rights cannot touch to the detriment of any of the three. “All amendments to the Constitution made on or after 24th April, 1973 by which the Ninth Schedule is amended by inclusion of various laws therein shall have to be tested on the touchstone of the basic or essential features of the Constitution as reflected in Article 21 read with Article 14, Article 19, and the principles underlying them,” ruled a unanimous nine-judge Constitution Bench in I.R. Coelho v. State of Tamil Nadu, AIR 2007 SC 861, holding that Article 14, 19 and 21 reflect the basic or essential features of the Constitution and are thus part of the Basic Structure of the Constitution. Asking uncomfortable questions, demanding truthful, evidence-backed answers and expressing discontent if the authorities fail to respond satisfactorily in exercise of one’s right to freedom of speech is not just a right but also a crucial democratic duty because it is only through well-informed critical analysis that the truth is revealed and a strong and prosperous nation can be built only upon the sound foundations of unquestionable and verifiable facts. There is no obligation to trust anybody’s claims absent reliable verification, and in refusing to trust unverified claims one does not turn into an “anti-national” but continues to be a responsible citizen who refuses to allow room for propagandist tendencies to take hold. Democracy is about keeping the government accountable to the people, and public accountability through multi-level transparency is the most effective, if not the only, answer to corruption. It appears that in the recent times we have waivered from the constitutional spirit of freedom of speech as enshrined under Article 19 (1) (a) and have been a little too quick in labeling people “anti-national” or “seditious” for asking questions or distrusting the government or criticizing the government or its functionaries too sharply, or for even being insufficiently respectful. One might disagree with the content of someone’s speech or the way the freedom of expression is used or misused, but that by itself is no reason to call for its curtailment because the luminance of the freedom of expression far outweighs and outshines the flickering darkness of a few grey shadows that the presence of light might cast. Criticizing one’s nation is nothing short of self-criticism aimed at self-improvement, and those who hold themselves above criticism are always the ones left alone without guidance to fall prey to their own self-righteous conceit. We do not wish such a fate for ourselves as a nation, or so I hope. 1. Mohammad Ibrar, Pulwama remark: Law student hits teacher, Feb 23, 2019, https://timesofindia.indiatimes.com/city/bengaluru/karnataka-students-make-professor-apologise-for-praising-pakistan/articleshow/68243286.cms?utm_source=facebook.com&utm_medium=social&utm_campaign=TOI&utm_content=om-bm&fbclid=IwAR0hheWco98sihz_IrM054MUBldKZa_TLrU6hOnwJhjJ9dwRNldjRyNczT0, Last Accessed: March 19, 2019. 2. Express News Service, DU students protest against teacher for ‘Pulwama remarks’, March 1, 2019, https://indianexpress.com/article/cities/delhi/delhi-university-students-protest-teacher-for-pulwama-remarks-5605763/, Last Accessed: March 19, 2019. 3. India Today Web Desk, ABVP workers force Karnataka professor to kneel, apologise over FB post praising Pakistan PM Imran Khan, March 3, 2019, https://www.indiatoday.in/india/story/abvp-party-workers-force-karnataka-professor-to-kneel-apologise-over-anti-india-social-media-post-1469428-2019-03-03, Last Accessed: March 20, 2019. 4. India Today Web Desk, Afzal Guru: A martyr in JNU campus? 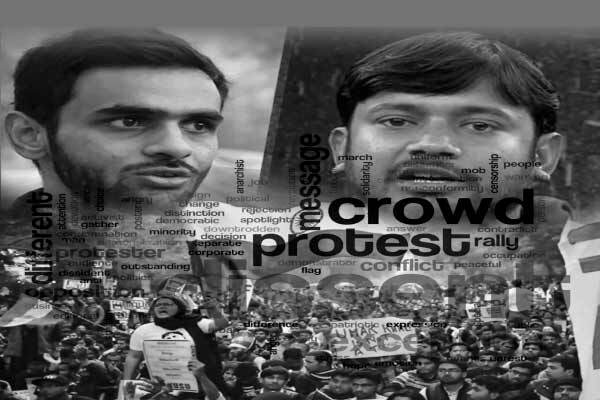 Anti-India slogans raised, no arrests made, February 11, 2016, https://www.indiatoday.in/education-today/news/story/jnu-afzal-guru-308204-2016-02-11, Last Accessed: March 21, 2019. 5. JNU row: Provocative slogans were shouted by outsiders, says university’s probe panel, MArch 16, 2016, https://zeenews.india.com/news/india/jnu-row-provocative-slogans-were-shouted-by-outsiders-says-universitys-probe-panel_1866104.html, Last Accessed: March 21, 2019. 6. Delhi High Court, Kanhaiya Kumar v. State of NCT of Delhi, W.P. (CRL) 558/2016 & Crl. M.A. Nos. 3237/2016 & 3262/2016, March 2, 2016.